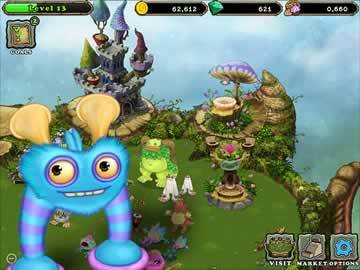 My Singing Monsters Game - Download and Play Free Version! Purchase, Breed and Assemble an Orchestra of Musical Monsters! In most games where you breed monsters, you raise them to fight. However, My Singing Monsters does something a whole lot different. These monsters don’t want to commit acts of violence upon their brethren; they just want to make music. Breed a band of musical monsters and see if you can get a good rhythm going. Do you want a lot of percussion beats to your tune? Would you like to hear a chorus of deep baritone voices, or would you rather get a good mix of vocal ranges out there? What kind of instruments would you like to accompany the singing? All of these questions will be yours to answer. These aren’t just any singing monsters after all; they are your singing monsters! Putting a band together has never been easier. The critters of My Singing Monsters don’t need any education or formal training to become high-class singers; making music is like breathing to them. Take good care of your monsters, and they’ll reward you with a cool rhythm and a catchy beat. 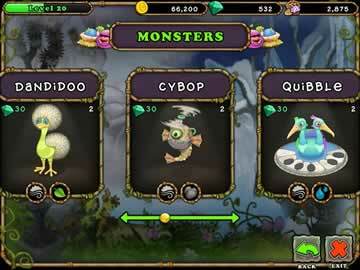 Collect over a dozen different monsters, each with their own distinct appearances, singing voices and musical styles. Selectively mute specific monsters to alter the song accordingly. Arrange your monsters in whatever way you like on the island. Listen to the music that your monsters make. Get a winning combination together to create a song that will never leave your head. Obtain new monsters by either buying them from the shop or breeding your current stock. Improve your monsters’ levels by feeding them delicious treats. Higher-level monsters produce larger amounts of money. Spruce the island up. Add exotic plants, build ornamental structures, and clear out unwanted vegetation and rocks. Visit islands created by other players and listen to the music that they have made. Believe it or not, raising a band of singing monsters can be a surprisingly profitable venture. That’s a good thing, because the flip side is that it’s a costly one as well. If you want to put together the monster band of your dreams, be prepared to do a lot of hard work to earn the funds. Monsters generate coins over time. Give them an environment they like and you’ll improve the coins they yield. Sell excess monsters you no longer need or want for extra money. Earn experience over time to improve your personal level. Higher levels give you access to better gear and more exotic monsters. Spend rare gems to speed up the process needed to bake food, incubate eggs, breed monsters, and so on. Play minigames like Memory or Scratch-Off to potentially earn bonus awards like free food and monster eggs. Complete missions and unlock achievements to acquire extra money, experience, food and more. There’s only one thing that isn’t a monster in My Singing Monsters: the price tag. The game can be downloaded, installed and played for free with all the good stuff you should expect. You have adorable monsters, multiple ways to acquire them, an island to design in your image, and money to make. Most of all, you have one heck of catchy tune that can be customized in endless ways. 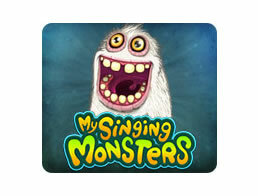 My Singing Monsters is a monster mash for anyone in the mood for something on the wild side.